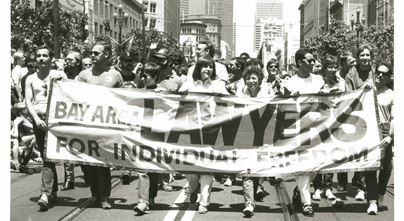 Bay Area Lawyers for Individual Freedom (BALIF) is the nation's oldest and largest association of lesbian, gay, bisexual and transgender (LGBTQI) persons in the field of law. Founded in 1980, BALIF represents its members’ interests in the wider San Francisco Bay Area. BALIF members and supporters include San Francisco Bay Area judges, lawyers, law students and legal workers. BALIF was founded to encourage LGBTQI legal professionals to apply to become judges. At the time there were no openly LGBTQI judges. Today there are many! BALIF also started the organization that grew to become the now-independent AIDS Legal Referral Panel, which has provided free and low-cost legal assistance to over 72,000 people since it was founded in 1983. Today, BALIF’s mission has expanded. The group takes action on questions of law and justice that affect the LGBTQI community; strengthens professional and social ties among LGBTQI members of the legal profession; builds coalitions with other legal organizations to combat all forms of discrimination; promotes the appointment of LGBTQI attorneys to the judiciary, public agencies and commissions in the Bay Area; funds scholarships for LGBTQI laws students and fellowships for public interest lawyers working on LGBTQI issues, and provides a forum for the exchange of ideas and information of concern to members of the LGBTQI legal community. BALIF also submits amicus briefs in cases affecting the LGBTQI community, sponsors resolutions to the Conference of Delegates of California Bar Associations, provides LGBTQI-focused continuing legal education opportunities and endorses candidates for judicial offices and legal elected positions. If you want to get involved in any of these activities, please look around the website and send an email to the appropriate Committee Chair. Or just send an email to chair@balif.org and we can direct you to the right person. BALIF is committed to building coalitions with other minority bars, as well. For example, BALIF and the Charles Houston Bar Association are proud to present "Honoring Julius: Reflections on Intersectional Advocacy in the Legal Profession and Beyond" on on Thursday, October 4, 2018 from 6:00-8:30 p.m. to honor the life of Julius Turman, a former BALIF co-chair, who passed away on May 14, 2018. Julius Turman was a pillar in our community and served as the San Francisco Police Commissioner, co-chair of the Alice B. Tolkas Democratic Club and worked in many capacities as a lawyer in government and big law. The event will feature accomplished panelists, David Tsai, Angela Padilla, Susan Christian, and David Campos, and will be moderated by Brandon Lawrence-who is a member of both BALIF and Charles Houston Bar Associations. In another example, BALIF worked with InterACT, Advocates for Intersex Youth, to support Senate Concurrent Resolution (SCR) 110, which passed, and which affirms the legislature's respect for the bodily autonomy of children born intersex and calls upon those in the healthcare professions to take necessary measures to protect such children from harmful surgical procedures performed without their consent. BALIF is also co-hosting an event with InterACT on November 8, which is also Intersex Day of Remembrance. The Annual Gala is one of the most popular BALIF events of the year. Many public officials attend the gala, past attendees have included legislators, mayors, district attorneys, labor commissioners, and other public officials, in addition to over 600 members of the community. Organization sponsorship of BALIF funds most of BALIF’s work, and a list of this year's sponsors set forth on this website shortly.